The horror anthology feature film�with a number of separate short stories linked together by a bookend main story of some kind�is sort of a lost art today, but in the late 1960s and early 1970s that was the claim to fame for Amicus Studios. With a healthy set of anthologies as part of their catalog�Dr. Terror's House of Horrors, Tales From The Crypt, Vault of Horror�the studio found great success with the format, and in 1972 took a set of Robert Bloch (Psycho) short stories, former Hammer director Roy Ward Baker and an impressive set of actors to take on Asylum, yet another well received collection of unrelated tales connected by a narrative that serves as the common bond. The thread here is the incurably insane residents of the Dunsmoor Asylum, where in order to land a job there the young Dr. Martin (Robert Powell) has to interview four patients to determine which one of them is the former asylum director. It's part of a twisted little game by the wheelchair-bound Dr. Rutherford (Patrick Magee), and as Martin spends time with the four patients, we then learn their dark backstories, and how they supposedly came to arrive at Dunsmoor. It's clear they're all nuts, but which one is the doctor? There are all sorts of strange things at play here, from severed limbs seeking revenge to a tiny mechanical doll with a mind of its own, and Baker shows his chops by tightly directing the various stories, using clever camera angles to make what could easily have been purely laughable suspense seem somehow genuine. Not all of the effects have aged especially well since 1972�the mechanical doll in particular waffles between comical and macabre�but gimmicks such as the breathing of a disembodied head wrapped in butcher paper still comes across as effectively moody. Aside from using a talented horror director like Baker, a strength of the Amicus anthologies was also the caliber and range of the cast. 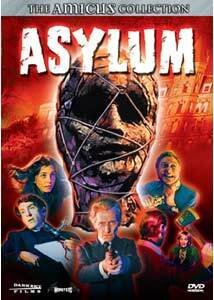 Asylum was really no exception, with familiar faces like Peter Cushing, Herbert Lom, Charlotte Rampling, Britt Ekland, Barbara Parkins and Patrick Magee really dressing up the material, adding a layer of higher rent emoting in what was understandably a low-budget shell. No one really holds court as the main star here, though Robert Powell probably gets the most screentime as he interviews patients, but Cushing, Lom and Magee deliver the three most ominous and memorable performances, though none appear together at any time here. The premise is fun, and this is a vintage 1970s horror good time from one of the genre's most underrated directors. Image Transfer Review: Dark Sky has issued Asylum in 1.85:1 anamorphic widescreen, mastering the transfer from original 35mm vault materials. This shames the previous Image release, and though this print still sports a few instances of very minor specking and nicks, the overall presentation is a significant improvement. There is some moderate grain, but colors�despite some periodic fluctuation in intensity�generally appear stable and warmly saturated. Audio Transfer Review: Audio is presented in a new 2.0 Dolby Digital mono mix. Nothing especially exemplary about it, but it is hiss-free and though screams come across somewhat shrill, the bulk of the dialogue sounds above bar, considering the limited fidelity range. Extras Review: Another nice job from Dark Sky on the supplements, led by a history-lesson-disguised-as-a-commentary track from film historian Marcus Hearn who serves as moderator for director Roy Ward Baker and camera operator Neil Binney. A few quiet spots here and there, but otherwise chock full of remembrances about the production, with Baker leading the discussion, and oddly enough still hesitant to discuss the particulars of the effects for the severed limb sequence. In addition to the informative commentary, there's also Inside The Fear Factory (19m:57s), a 2003 Blue Underground feature chronicling the Amicus story; presented in anamorphic widescreen, the doc features input from Amicus head Max Rosenberg, along with directors Freddie Francis (Dr. Terror's House of Horrors) and Roy Ward Baker. It's a thumbnail sketch of the studio's beginning, with Baker offering up his own rather blunt feelings about the tail end of the Amicus run. There's talk of the joy of working with Peter Cushing, and Baker recalls Asylum as an enjoyable "box of tricks". There's a set of three trailers, a Photo Gallery of 30 images, consisting largely of posters and lobby cards for Asylum, along with an insert booklet with a brief Amicus history written by Christopher Gullo. Also included are bios of Peter Cushing, Britt Ekland, Roy Ward Baker, Herbert Lom, Max Rosenberg and Milton Subotsky. The disc is cut into 10 chapters, with optional English subtitles. Probably my favorite of Dark Sky's burgeoning Amicus Collection, this Roy Ward Baker-directed anthology has a solid ensemble cast�including Peter Cushing and Herbert Lom�that saves even the most telegraphed "surprise" ending. A sharp new transfer and a strong set of extras make this a necessity for old-school horror fans.